Knockshinnoch Castle Colliery was situated in the Parish of New Cumnock in Ayrshire about 22 miles due east of the town of Ayr. Before the accident the colliery employed about 600 men underground and 120 at the surface with a weekly output varying from 4,500 to 5,000 tons. The output came from two seams, the Main Coal and the Turf Coal with the major proportion coming from the Main Coal. The downcast shaft was completed in 1942 and was used for winding men, materials and mineral and was 16 feet in diameter sunk to 122 fathoms. The older Knockshinnoch No.1 pit served as the upcast shaft and as the second exit which was only about a quarter of a mile to the north of the downcast shaft and was 12 feet in diameter and 70 fathoms deep. The ventilation was produced by an Aeroto fan which was at the surface of the No.1 pit and passed 65,000 cubic feet of air per minute at a water gauge of 4.5 inches. Safety lamps were used throughout the mine and the type provided for the workmen underground were the Oldham, Wheat Q Type, 4-volt electric cap lamp. For gas testing, the workmen were issued with Prestwich Patent Protector, Type SL, magnetically locked flame safety lamps and the officials with the Prestwich Patent Protector, Type No.6 flame safety lamp fitted with internal re-lighters and magnetically locked. Limestone dust was used for stone dusting throughout the colliery. At Knockshinnoch Castle downcast shaft an underground pump, with the capacity of 500 gallons per minute, which ran for three hours a day and a second with a capacity of 125 gallons per minute which ran for 12 hours a day. The colliery was operated by the National Coal Board, Scottish Division and was one of fifty producing collieries, many relatively small which were in the Ayr and Dumfries Area. The Area was divide into three Sub-Areas, each of which were divided into Groups. 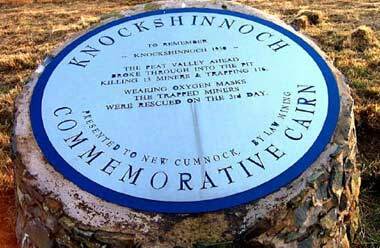 Knockshinnoch Castle was the largest of the six collieries in the New Cumnock Group in the Dunaskin Sub-Area which had 21 collieries in it. The manager of the colliery was Mr. W.C. Halliday who was assisted by an Undermanager, Mr. B.Y. Kennedy. There was an overman, Mr. J.N. Houston who was in general charge underground of the day shift and he was followed by a second overman, Mr. Andrew Houston, who was in charge underground on the afternoon shift. There was no overman on the night shift. Five firemen were in charge of the working districts on each of the three shifts, Mr. J. Bone was the Agent for the New Cumnock Group. the Dunaskin Sub-Area was under the general charge of Mr. A.M. Smart, the Sub-Area Production Manager who was in turn responsible to Mr. A.B. Macdonald, the Area Production Manager. Mr. D.L. McCardel was the Area General Manager. All these higher officials held a first-class Certificate of Competency. Mr. C. Stewart and his senior assistant was Mr. T.D. Brown. The surveyor attached to the New Cumnock Group was Mr. R. Arbuckle who was assisted by an apprentice surveyor, Mr. Ian Murray. This portion of the Ayrshire coalfield in the New Cumnock district lay at the extreme southern edge of the coal measures and was bounded on the south by a large upthrow fault, the Southern Uplands Fault. The coalfields was unique among the coalfields of Britain in that the workable seams that are found in four groups of the carboniferous rocks, the Barren Red Measures, True Coal Measures, Millstone Grit Series and the Limestone Series. There were twenty eight coal seams which were greater than two feet thick which had been proved and of these seventeen are over three feet thick and nine exceeded four feet. These seams were unknown in the Knockshinnoch Castle Colliery Area until a few years before the disaster and the existence of the Main Coal was only finally proved in 1938. Apart from the Southern Uplands Fault, the New Cumnock coalfield was very faulted which resulted in the field being broken up in to areas that were more or less detached and in some of these area coal had been worked for many years. One of the seams that had been worked over the years was locally known as the ‘Eight Feet’. In an older colliery near the Knockshinnoch Castle Colliery a thick seam had been worked for many years and it was believed to be the Eight Feet. About 1932 the Geological Survey suggested that this was not the Eight Feet but was an entirely new seam and the geological position of this seam was about 100 fathoms below the Eight Feet in the True Coal Measures. To test this theory a borehole was put down in 1924 but the recorded results were disappointing and did nothing to alter local opinion. Some years later the views of the Geological Survey were reconsidered and it was decided that further boring was justified. A borehole was put down in 1938 and gave excellent results. It proved the existence of the Main Coal at the approximate position previously indicated by the geologists of the Survey as well as that of three other workable seams. Further boring confirmed the existence of these seams over several square miles which added many millions of tons to the reserves of the area. 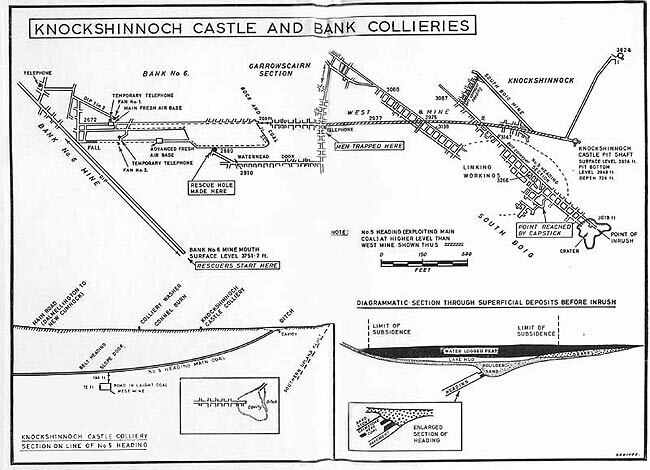 This valuable extension to the coalfield led very soon to the planning of the Knockshinnoch Castle Colliery and the sinking of the downcast shaft began in 1940 and was completed in 1942. Because of the inclination of the seams and the decision of the previous owners, the New Cumnock Collieries Limited, to use locomotive haulage in the main roads leading to the bottom of the pit, the shaft was not sunk to a particular seam but to a suitable horizon from which almost level mines or stone drifts were driven as main haulage roads to give access to the seams that were to be worked, especially the Main Coal. In common with the coalfield as a whole, the area of coal to be worked by the colliery was heavily faulted and due to these disturbances the gradients of the seams varied from comparatively level to 1 in 2 and in parts even steeper. In addition the composition and thickness of the seams were subject to variation. This was particularly true in the Main Coal which was approximately eight feet thick in which there were three distinct coal beds which were separated by dirt bands and with either a strong sandstone or a relatively weak ‘calmstone’ forming the roof. Where the sandstone formed the roof, the full thickness of the seam was extracted and where the roof was calmstone the top leaf of the coal was left. The seams were naturally damp and it was not uncommon for the working places to be wet. In the district where the disaster occurred , the No.5 Heading Section in the South Boig Area, the composition of the Main Coal remained reasonable constant and the coal lay in three beds which were known locally as the ‘head coal’, the ‘breast coal’ and the ‘bottom coal’, separated by dirt bands with a calmstone roof above the head coal. Above the calmstone there was another thin bed of coal known as the Pennyvenie Seam which was overlain by a bed of sandstone. The method of working was Stoop and Room, the rooms being driven 16 feet to 18 feet wide to form stoops approximately 100 feet square. The direction of advance of the No.5 Heading Section was to the south east towards the Southern Uplands Fault with the gradient steepening from 1 in 14 to 1 in 2 in the No.5 Heading which was the main haulage road for the district and was the leading place. Because the calmstone was weak and difficult to support the head coal was left to form the roof and only the breast coal and the bottom coal were extracted with the associated dirt bands which gave a working height of about 7 feet. The coal was blown from the solid by explosives and the shotholes were bored by electrical machines with approximately 18 holes being bored for each round of shots. The faces advanced about 9 feet per shift and two shifts of coal getters were employed. The coal was hand loaded on to scraper conveyors which delivered to a series of belt conveyors, two in the No.5 Heading and one in the Belt Conveyor Heading. At a central loading point at the junction of this heading with the South Boig Mine, the coal was delivered into tubs which were hauled to the pit bottom by locomotives by way of the South Boig and the West Mines, both of which had a gradient dipping slightly towards the shaft. In the headings going steeply to the rise, the No.5 Heading, a short shaker conveyor was used next to the face. For several days before the accident this heading had been stopped and the shaker conveyor partly dismantled. At the neighbouring Bank No.6 Colliery, the Main Coal was reached by a dipping drift driven from the surface, mostly in stone but partly in coal, with a gradient varying up to 1 in 3.6. The mouth of the drift lay approximately a mile to the south west of the Knockshinnoch Castle Colliery. About 1944 a district in Bank No.6, known as the Waterhead Section, was worked to the rise by a longwall face. Later the Main Coal in Knockshinnoch Castle was also worked in the Waterhead Area towards Bank No.6 leaving a barrier of coal 200 feet wide between the two collieries. In order to facilitate drainage from the Knockshinnoch side, a roadway was driven into this barrier up to a point about 24 feet from the Bank No.6 workings. A borehole was then put through the remaining part of the barrier to carry the water. it was through this part of the mine that the escape road was driven, by which 116 men imprisoned by the disaster were eventually rescued. Deposits of peat moss occurred on the surface in the immediate neighbourhood of both the collieries and were shown on the 6-inch Geological Survey Map of Ayrshire, Sheet XLII S.W. One such deposit was shown, part of which actually covered the place where the disaster originated. There was no previous history of an inrush of moss in the area but a few years before work had been carried on underground in Bank No.6 Colliery when Mr. J. Bone was the Agent, when a surface peat deposit had to be probed to determine its thickness in order to comply with the General Regulations of 1920, relating to precautions to be taken when working under a peat moss.